Ludwig Andreas von Feuerbach (July 28, 1804 – September 13, 1872) was a nineteenth century German philosopher, known for his critique of religious belief. He is commonly regarded as a bridge between the philosophies of Hegel and Marx. Along with Schopenhauer, Kierkegaard, Marx, and Nietzsche, Feuerbach was one of the philosophical outsiders who rebelled against the academic philosophy of the nineteenth century and thought of themselves as reformers and prophets of a new culture. He began his career as an enthusiastic follower of Hegel, but eventually rejected Hegelian idealism which supported Christianity, and developed instead a materialist interpretation of religion. 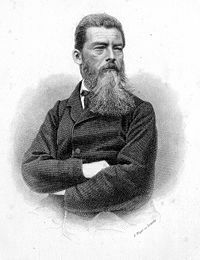 Feuerbach emerged in the 1840s as a leader of the Young Hegelians, after the publication of The Essence of Christianity (1841), in which he contended that all the doctrines of Christianity, including the concept of God, were a reflection of either of human characteristics or of the deepest wishes of human nature. Feuerbach maintained that the proper object of philosophical study is man himself, and nature, rather than God or a reality which transcends human experience. His later writings were concerned with developing a materialistic humanism and an ethics of human solidarity. Feuerbach is most remembered for his influence on Karl Marx and for his humanistic materialism. Ludwig Feuerbach, was born July 28, 1804, in Landshut, Bavaria, into a distinguished family of five sons and three daughters. His father, who dominated the family, was a famous professor of jurisprudence who, although a political liberal and a Protestant, revised the legal code of Bavaria and was knighted by the court. Ludwig’s eldest brother, Joseph Anselm, became a noted archaeologist and the father of the famous German painter, Anselm Feuerbach. The second son, Edward, became a professor of jurisprudence, and the third, Karl, a mathematician who had a proof named after him. Ludwig was very religious as a child, but while attending the Gymnasium in Ansbach he was introduced by his tutor to the speculative Christian theology of the Hegelian Professor Karl Daub and became interested in the philosophy of Hegel then predominant at the University of Heidelberg. Determined to study theology, Feuerbach, with his father's permission, entered Heidelberg in 1823. His father, who despised Hegelianism, hoped that Ludwig would become disenchanted with it when he encountered the teachings of his friend and rationalistic theologian, H.E.G. Paulus. Feuerbach, however, was attracted by the Hegelian thought of Daub and disgusted with the lectures of Paulus. Still, he was troubled by the inability to reconcile his belief in a personal deity with the pure Vernunft of Hegelian philosophy. His sympathetic professor, Daub, recommended he resolve his difficulties by studying with the master in Berlin. Doubtful that his father would grant him permission to study with Hegel, Feuerbach pretended that he wanted to matriculate in Berlin in order to study with the famous theologian, Friedrich Schleiermacher. The father reluctantly agreed and Feuerbach arrived there in the spring of 1824. Immediately he found himself under police surveillance because of his suspected membership in one of the subversive groups of the Burschenshaft movement, and he was unable to matriculate until the matter was resolved. (His brother Karl had been put in prison in 1824 for the same reason.) During the summer of 1824, Feuerbach attended Hegel's summer semester lectures in Logic and Metaphysics and the Philosophy of Religion, and this experience, he wrote later, became the turning point of his life. He transferred to the philosophy faculty over the objections of his father. Financial restrictions forced Feuerbach to transfer to Erlangen, where he studied anatomy, botany and physiology while working on his dissertation, De ratione, una, universali, infinitata, (On the infinitude, unity, and commonality of Reason). Feuerbach sent a copy of the dissertation to Hegel, hoping for his approval, but inadvisably added a letter in which he offered the opinion that the attempt to comprehend Christianity as the consummate religion, as Hegel had done, was bound to fail. Christianity, he wrote, "is the religion of the pure self." After two years as a disciple of Hegel, Feuerbach became associated with a group known as the Young Hegelians, who synthesized a radical offshoot of Hegelian philosophy. "Theology," he wrote to a friend, "I can bring myself to study no more. I long to take nature to my heart, that nature before whose depth the faint-hearted theologian shrinks back; and with nature man, man in his entire quality." He completed his education at Erlangen at the Friedrich-Alexander-University, Erlangen-Nuremberg, with the study of natural science. After successfully defending his dissertation in 1828, Feuerbach was appointed Privatdozent at Erlangen and began lecturing on the history of philosophy and on logic and metaphysics. Between the years 1833-1837 he published three books which established his reputation as a rising young scholar, The History of Modern Philosophy from Bacon to Spinoza (1833), The Presentation and Development and Criticism of Leibniz's Philosophy (1837), and Pierre Bayle (1838). By 1837 he was contributing to the most influential Hegelian journal, the Jahrbücher für wissentschaftliche Kritik. Feuerbach had hoped his publications might secure him a position at a less conservative university than Erlangen. However, in 1830, against his father's wishes, he had also published anonymously a book entitled Thoughts on Death and Immortality. It argued that individual human consciousness is only part of an infinite consciousness, into which it will be absorbed at death; and that belief in a personal deity and immortality is merely an expression of egoism. Feuerbach unwisely appended a series of satiric epigrams and aphorisms making fun of popular religious doctrines. The book was confiscated, and when he refused to swear that he was not the anonymous author, Feuerbach was dismissed from Erlangen. He was unable to find employment in another university, and his academic career was ruined, as his father had predicted. In 1837, Feuerbach married a wealthy young woman, Berthe Löw, who was part owner of a small porcelain factory in Bruckberg, near Ansbach, in Bavaria. He retired to Bruckberg and became an independent scholar, keeping in contact with other scholars through correspondence and occasional visits to his friend, the philosopher Christian Kapp, in Heidelberg. Soon after his retirement to Bruckberg, Feuerbach made contact with Arnold Ruge, who, with Theodore Echtermeyer, was the co-editor of a new journal, the Hallische Jahrbücher für deutsche Wissenschaft und Kunst, dedicated to using the critical aspects of Hegel's philosophy to bring about social and cultural reform. The editors believed that Germany, under Prussian leadership, would soon become the world leader in philosophy, religion, and politics, if it could only realize the liberal elements inherent in Hegelian philosophy. By 1839 it became clear to them that the progress they envisioned was being hampered by the Prussian state and its resistance to reform in both religion and politics. Threatened by censorship, the Journal moved in 1840 from Prussia to Dresden, in Saxony, and began to openly attack government. In 1843, the Journal was confiscated after publishing the radical attacks of Bruno Bauer, forcing the editors to take it first to Switzerland, where it changed its name to the Deutsche Jahrbücher, and then to Paris, where it became the Deutsch-Französische Jahrbücher under the editorship of Ruge and Karl Marx. During several years of struggle, Feuerbach published Geschichte der neueren Philosophie (2 vols., 1833-1837, 2nd ed. 1844), and Abelard und Heloise (1834, 3rd ed. 1877). In two works of this period, Pierre Bayle (1838) and Philosophie und Christentum (1839), which deal largely with theology, he claimed to have proven "that Christianity has in fact long vanished not only from the reason but from the life of mankind, that it is nothing more than a fixed idea" in flagrant contradiction to the distinctive features of contemporary civilization. Feuerbach had already achieved some attention for his "Critique of Hegelian Philosophy" published in the Hallische Jahrbücher in 1839. The publication in 1841 of Das Wesen des Christentums (The Essence of Christianity, translated into English by George Eliot, 1853, 2nd ed. 1881; French and Russian), that established him as an intellectual leader of the Left Hegelians. He had, to paraphrase the words of Engels, "exploded the System and broken its spell." The book is still regarded as the precursor of all projection theories of religion. It sparked considerable controversy; some radicals, like Max Stirner, thought the book was “too religious.” Feuerbach revised The Essence of Christianity and then wrote two philosophical manifestos, Preliminary Theses on the Reform of Philosophy (1842) and Principles of the Philosophy of the Future (1843), and a short book on Luther. The two earlier works argued that a cultural epoch has come to an end with Hegel and that the truth in Hegel's thought could only be realized in a "new philosophy" that was atheistic. Feuerbach never systematically developed the bold and radical ideas proposed in his manifestos. In 1845, he again interpreted religion in Das Wesen der Religion, significantly revising the position he had presented in The Essence of Christianity. During the revolutions of 1848 in the German states, Feuerbach's attack upon orthodoxy made him something of a hero with the revolutionary party; but he never invested himself in the political movement, and did not demonstrate the qualities of a popular leader. At the height of his influence, he became enthusiastic about the revolution in France and its inevitable impact on Europe, and decided to attend the Frankfurt Assembly as an observer. While he was in Frankfurt, students of Heidelberg, who hoped to have him invited to join the faculty of philosophy, asked Feuerbach to give a series of public lectures on the nature of religion. The university rejected the students and denied him university facilities in which to speak, so that he delivered the lectures in the city hall. Feuerbach was disappointed by the failure of the Frankfurt Assembly and the political reaction to it, and returned to the isolation of Bruckberg, where he began an amateur study of geology. By the 1850s he was no longer a dominate philosophical presence in Germany. His private life was disturbed by three painful occurrences: the death of an infant daughter; a breach with his wife after 1849 because of his infatuation with his best friend’s daughter, Johanna Kapp; and an intrusive search of his papers and correspondence by the state secret police looking for his connection to a young radical. In 1860 the porcelain factory failed and Feuerbach moved from Bruckberg to Rechenberg, near Nürnberg. He would have suffered extreme poverty if not for the assistance of friends, supplemented by donations from the Social Democratic Workers Party. Although he worked on philosophical issues concerning the freedom of the will and ethics, he published little after 1857 except still another interpretation of religion entitled Theogonie. His last book, Gottheit, Freiheit und Unsterblichkeit, appeared in 1866 (2nd ed., 1890). After a lingering illness, he died on September 13, 1872. He is buried in the same cemetery in Nuremberg (Johannis-Friedhof) as artist Albrecht Dürer. Feuerbach, along with Schopenhauer, Kierkegaard, Marx, and Nietzsche, was one of the European philosophical outsiders who rebelled against the academic philosophy of the nineteenth century, and thought of themselves as reformers and prophets of a new culture. He is best known for his criticism of idealism and religion, especially Christianity. Feuerbach maintained that the proper object of philosophical study is man himself, and nature, rather than a reality which transcends human experience. His later works approached materialism, but he did not regard man as simply a product of matter. Feuerbach's most important works were Das Wesen des Christentums (1841, tr. by George Eliot, The Essence of Christianity, 1957 ed. ); Geschichte der neueren Philosophie (2 vol., 1833–37); and Gottheit, Freiheit und Unsterblichkeit(1866). Though a disciple of Hegel in his early years, Feuerbach always differed from Hegel over the relationship between idealism and Christianity. Hegel argued that his philosophy clarified as ideas (Begriffe) that which Christian theology had expressed in the form of imaginative symbolism (Vorstellung), and considered Christianity to be the “consummate religion.” Feuerbach, on the other hand, regarded Christianity as a religion of "pure selfhood." Feuerbach's contention that Hegelian idealism was incompatible with Christianity was supported by the publication of D.F. Strauss's The Life of Jesus Critically Examined (1835). The book demonstrated with historical detail that most of the traditional Christian claims about Jesus' supernatural activity were mythical and could not support Christian doctrine; therefore it was impossible to claim, as Hegel did, that the Idea was fully embodied in an individual. Feuerbach concluded that the problems of Hegel’s thought stemmed from the assumption of Absolute identity, an assumption which he had made from the very beginning of his philosophical career. Idealism explains the unity of subject and object, spirit and nature (matter), thought and being, by making both "nature" and "spirit" the attributes of an Absolute subject. Hegelian philosophy is really a form of "rational mysticism." Feuerbach claimed that Hegel’s treatment of the existence of matter could be interpreted in two ways. Hegel argued that the divine Subject objectifies itself in nature, and then struggles with this nature in order to achieve self-conscious freedom. Matter is therefore the self-expression (Selbstentäussserung) of Spirit, and only one phase in the struggle of the Divine life. Feuerbach argued that Hegel could be interpreted as a materialistic theist who views the history of nature and humanity as the life of God, or as a theologian who he negates the truth of atheism by having God take up matter into His own life. He "negates the negation" and affirms God. Feuerbach’s manifesto, Principles of the Philosophy of the Future (1843) embodied his criticism of Hegel and aimed at the overthrow of speculative philosophy and the establishment of a "new philosophy" based on empiricism and "sensuousness." Feuerbach is best known for The Essence of Christianity (1841), which may be described as an effort to humanize theology and identify religious consciousness with subjectivism. Feuerbach defined religion as man’s consciousness of the infinity of his own nature. Religion therefore is "nothing else than the consciousness of the infinity of the consciousness; or, in the consciousness of the infinite, the conscious subject has for his object the infinity of his own nature." Thus God is nothing else than man: he is, so to speak, the outward projection of man's inward nature. Hegel had said that Absolute Spirit achieves self-knowledge by objectifying itself in the finite world; Feuerbach said that the finite human spirit achieves self-knowledge by externalizing itself in the idea of God, and then discovering that this externalization is the only form in which the human spirit understands its own essential nature. This type of reasoning was what Feuerbach called his “transformative method;” Karl Max considered this method as Feuerbach’s contribution to philosophy. In the first part of The Essence of Religion, Feuerbach developed what he called the “true or anthropological essence of religion.” Examining various Christian doctrines portraying God as a “being of the understanding," as a “moral being or law," as “love,” and concepts such as creation, Incarnation, Logos, Trinity, immortality, Feuerbach attempted to show that each of these corresponded either to some human characteristic or to some human wish or feeling. "If man is to find contentment in God," he claimed, "he must find himself in God." The doctrine of God and of the Trinity were examples of the objectification of human characteristics, and the practice of prayer and the belief in providence and immortality were examples of the objectification of human wishes and feelings. In the second part of the book, Feuerbach discussed the "false or theological essence of religion," the concept that God has an existence separate from and greater than man. From this concept, claimed Feuerbach, arose various mistaken beliefs, such as the belief in revelation (which he believed not only injures the moral sense, but also "poisons, nay destroys, the divinest feeling in man, the sense of truth") and the belief in sacraments such as the Lord's Supper, which he regarded as a sort of religious materialism of which "the necessary consequences are superstition and immorality." The Essence of Religion emphasized the role of feeling in religious thought. Like Schleiermacher, Feuerbach believed that religion was principally a matter of feeling, manifested in desire and longing. He regarded feeling as "unrestricted subjectivity" which, unfettered by reason or nature, assumed that the deepest wishes of the heart were true. Feuerbach’s theories of religion received criticism from two directions; Christian theologians, and atheists such as Max Stirner and Bruno Bauer. A prominent Protestant theolgoian commented that while Feuerbach's thesis might apply to Catholicism, it did not apply to Protestantism. In 1844, Max Stirner’s book Der Einzige und sein Eigentum (The Ego and His Own) attacked Feuerbach as inconsistent in his atheism. Stirner criticized Feuerbach for replacing idealism with another abstraction, the “human essence,” as an object of veneration and a basis for morality. Feuerbach replied to the Protestant criticism by writing a book about Luther in which he contended that Christian faith is based on the anthropomorphic concept that human welfare is the aim and purpose of the Divine. To counter Stirner, Feuerbach conceded that he had been "still haunted by the abstract Rational Being…as distinct from the actual sensuous being of nature and humanity" (GW X: 188). In his later works he moved towards nominalism, emphasized human sensuousness and experience, and rejected any dualism of spirit and matter. Feuerbach’s work was too deliberately unsystematic ("keine Philosophie ist meine Philosophie," "my philosophy is no philosophy") to make him a power in philosophy. His works expressed in an eager, disjointed, but condensed and labored fashion, his deep conviction that philosophy must return from unsubstantial metaphysics to the solid facts of human nature and natural science, that the human body was no less important than the human spirit ("Der Mensch ist was er isst," "Man is what he eats") and that Christianity was out of harmony with the age. His diligence of character and his sincerity gave weight to his ideas, but he did not develop an effective justification of them. His legacy is continued by those who consider him to be one of the fathers of the modern critical academic study of religion. Feuerbach's influence was greatest on theologians such as Strauss, the author of the Leben Jesu (Life of Jesus). Many of his ideas were taken up by those who, like Arnold Ruge, had involved themselves in the struggle between church and state in Germany, and materialists like Friedrich Engels and Karl Marx, who sought to bring about social change through a political reorganization of government and economy. Some have said that Feuerbach influenced Bruno Bauer to follow him from Hegelianism to a form of naturalism, but this is disputed by modern writers because Bruno Bauer never cited Feuerbach as a source, and because he continued to pursue Hegelian themes of theology along with demythologization, dialectic and historical analysis in his New Testament criticism. Later, Marx and Engels rejected all the Young Hegelians, including Feuerbach to and Bauer in their famous work, The German Ideology and the shorter "Theses on Feuerbach." Feuerbach’s writings have been largely ignored by modern scholars because he was regarded primarily as a bridge between Hegel and Marx. The recent publication of a new critical edition of his works has renewed scholars’ interest in his mature views. Kamenka, Eugene. 1970. The philosophy of Ludwig Feuerbach. New York: Praeger. Feuerbach, Ludwig. Ludwig Feuerbach: "The Essence Of Christianity" in Relation to (Max Stirner's) "The Ego And Its Own", A Service of Max Stirner within the LSR project. First published in: The Philosophical Forum, vol. viii, nos. 2-3-4 (1978), pp. 81-91. Marx, Karl. Thesis on Feuerbach, Marx/Engels Internet Archive. As an Appendix to Engels’ Ludwig Feuerbach and the End of Classical German Philosophy, 1886; Marx/Engels Selected Works, Volume One, p. 13 – 15; Publisher: Progress Publishers, Moscow, USSR, 1969. History of "Ludwig Andreas Feuerbach"
This page was last modified on 3 August 2018, at 16:42.